I love New York City; the sounds, the lights, the culture, the people, the parks, the food, the culture, the FASHION. Every chance I get to visit the Big Apple, I’m filled with such excitement about all the things there are to do in the Empire State. 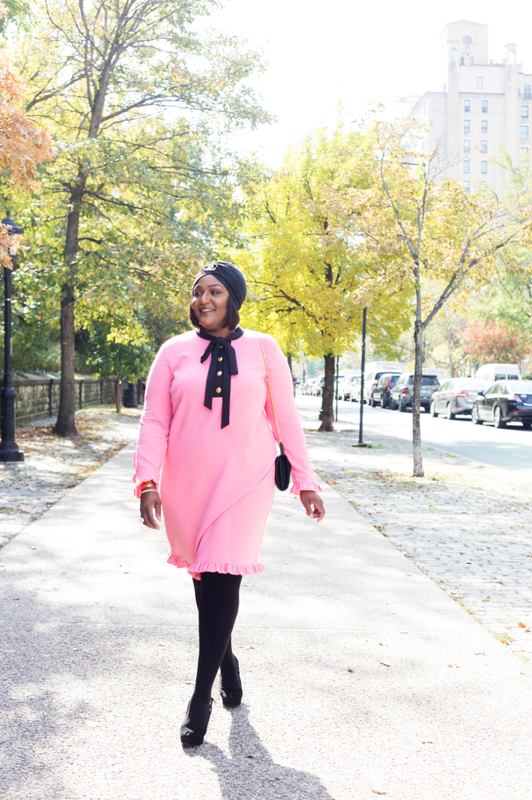 I live to shop in The City because as the epicenter of all things fashionable, New York City has lots to offer the enthusiastic fashionista. 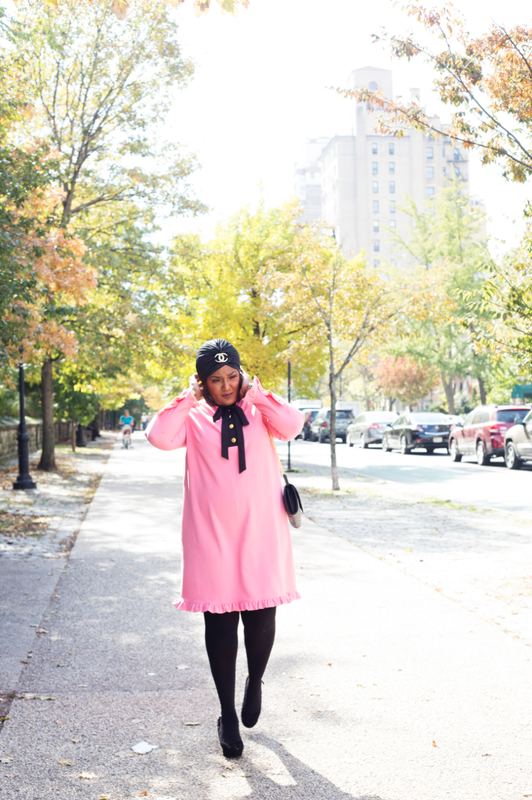 On a recent business trip to NYC, I got the opportunity to shoot some looks for NikkiFreeStyle.com at different spots in Brooklyn, and I knew exactly the looks I wanted to feature: All Things Eloquii (for the most part). 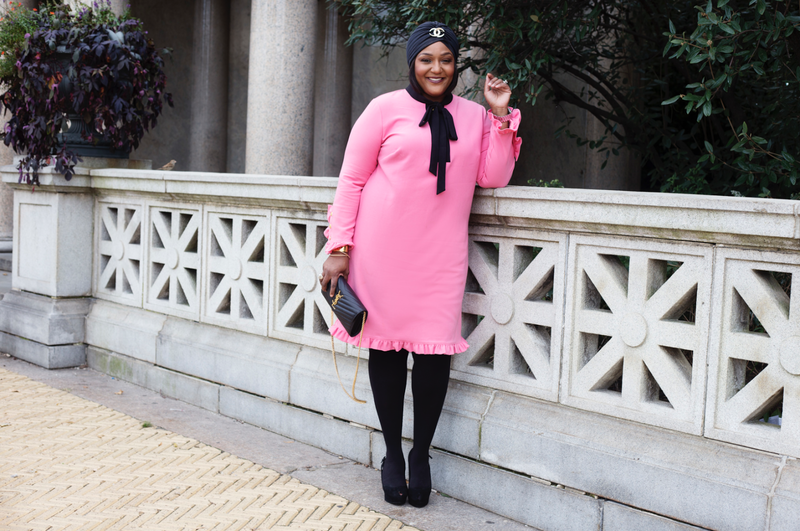 I can’t say enough how impressed I am with the quality and fashion forward looks the brand drops almost daily for plus women. 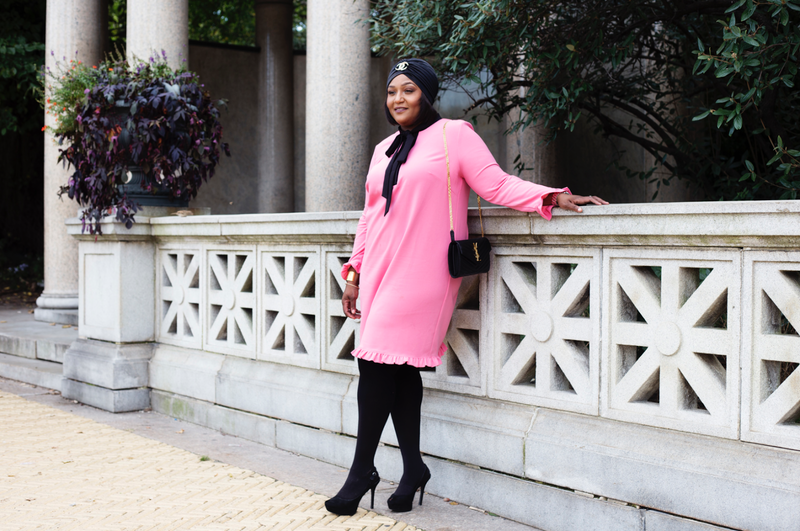 Their newest collection is absolutely amazing and has such a classic retro feel to it. 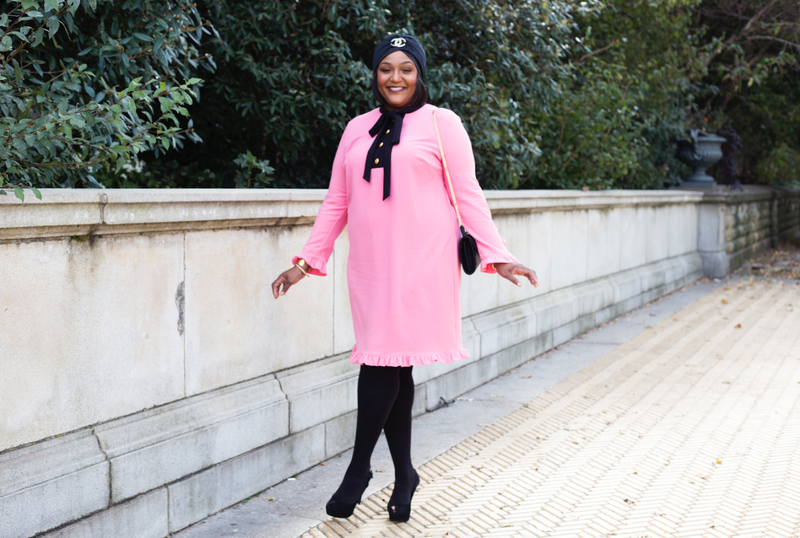 This gorgeous pink neck tie and ruffle dress was a must-have because it gave off such a Coco Chanel circa 1960’s vibe to me. It felt like a luxury piece but cost only a fraction of what even a pair of Chanel sunglasses would set you back. 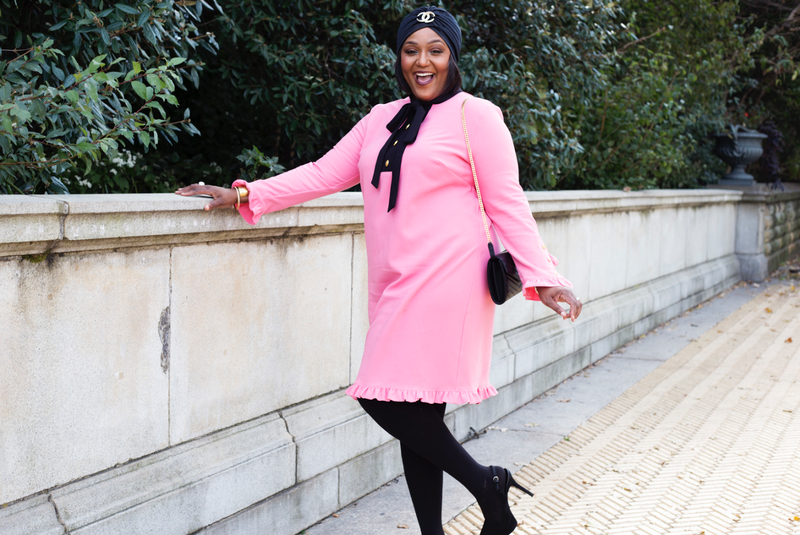 I wanted to play up the retro feel of this dress so I paired with opaque black tights, my go-to peep toe, sling back suede platform pumps, and for a little more edge, I added a black turban and attached my favorite Chanel brooch. 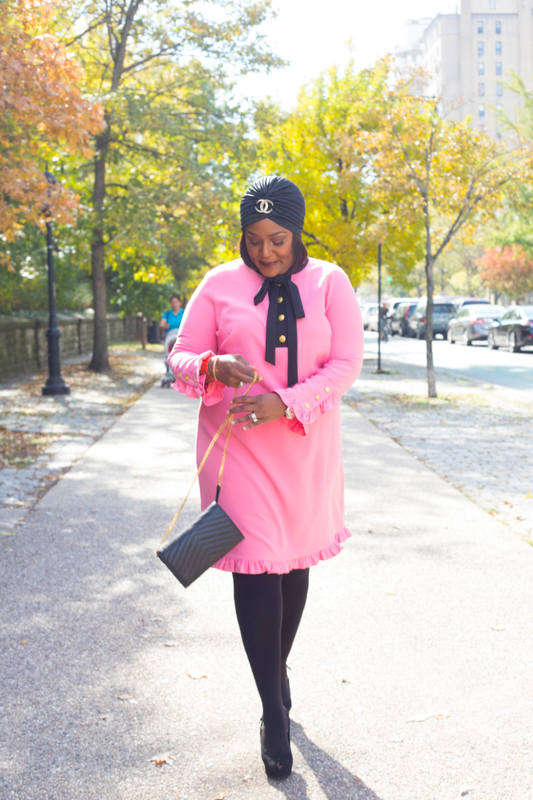 I included my favorite small handbag and the look was complete. These “flix” were shot near the entrance of beautiful Prospect Park, one of my absolute favorite spots in NYC. I guess I am drawn to the park because as a native Floridian, I am always looking for water, and it happens to have the only lake in all of Brooklyn. I had so much fun shooting this look (and a few more to follow) with Brooklyn-based photographer Myah Jones. 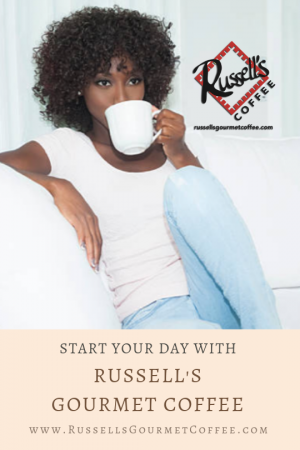 Besides being a sweet and personable young lady, she is very talented and accommodating. I really enjoyed working with her and think she did a fantastic job! 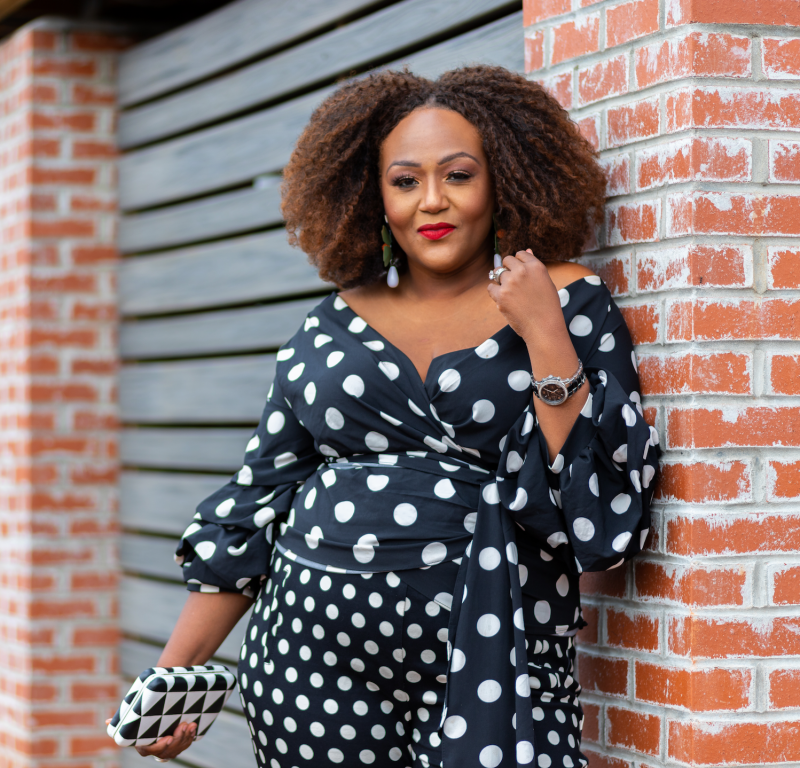 Also, go check out the way Jeniese, one of the women I was blessed to share the cover of Redbook Magazine‘s September 2015 issue with, styled this dress over on her blog The Jenesaisquoi. I think you will love it! As always, thanks for stopping by and please share your thoughts on the look. Hopefully, I have inspired some of you to step outside the box and try something a little different!